Offered as an alternative to mandrel-built wrapped silicone hose, AdvantaSil® APSH-DB provides several advantages over wrapped hose. 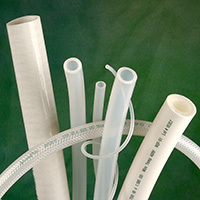 APSH-DB, an extruded product, is available in lengths up to 50 feet. It offers more flexibility than wrapped hose and comparable working pressure ratings. APSH-DB meets USP Class VI, FDA CFR 177.2600, ISO 10993 and European Pharmacopoeia 3.1.9 standards. Full BPOG standardized extractables test protocol has been performed on the hose liner by a fully-accredited, third-party test lab.